This is the very definition of FUBAR. We don’t have the money to do this first off. And training rebels has never worked. This is not going to work and they know it. It strikes me that someone is getting rich once again over a faux military program. Someone might want to check where the bulk of that $500 million is actually going. Probably to terrorists. The military has trained less than 100 and 0 have graduated from the program. Their goal is 3,000 by the year’s end. That’s laughable. Rebuilding the Iraqi army won’t work either – we’ve already been down that IED-filled road. Eventually, the US will have to involve ground troops to beat the evil of the Islamic State and war is raising its ugly specter globally. 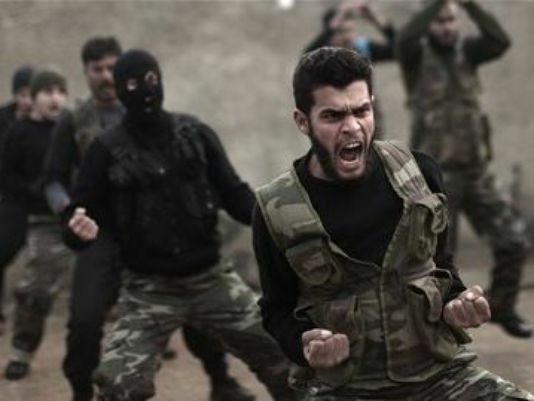 WASHINGTON — Fewer than 100 Syrian rebels are being trained by the U.S. military to fight the Islamic State group, a tiny total for a sputtering program with a stated goal of producing 5,400 fighters a year. On June 26, 2014, the White House said it was asking Congress for $500 million for a three-year train-and-equip program. It only got started in May, however. That program, together with a more advanced but also troubled parallel effort to rebuild the Iraqi army, is central to the U.S.-led effort to create ground forces capable of fighting IS without involving U.S. ground combat troops. The Syria initiative is seen more as a way of enabling moderate opposition forces to defend their own towns against the militants. Expectations for the Iraqis are much higher; the goal is to have them roll back IS and restore the Iraq-Syria border. The Syrians are for the most part ALL bad guys. If you sleep with the devil, you get screwed. We have to stop the spread of the Islamic State and the Caliphate. We need to stop playing at war and get serious militarily. That won’t happen with a Marxist as president. We need a true conservative Constitutionalist to address global terrorism. Not someone who throws $500 million at the problem, lets corrupt bureaucrats grow ever fatter with American funds and terrorists somehow get funding and weapons when they are supposed to be our enemies. Funny how that seems to work these days. Nothing is what it seems. Nothing.